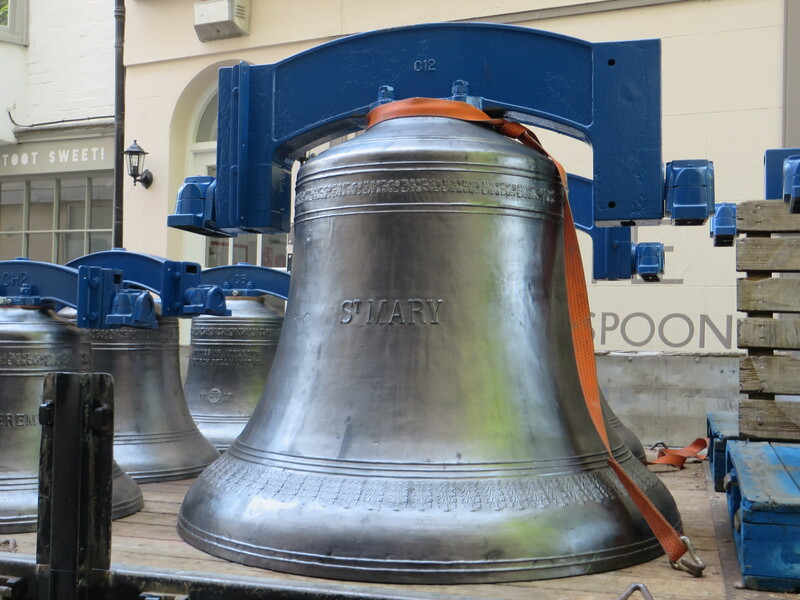 Here is a link to a fabulous film of the new bells being installed in three minutes! 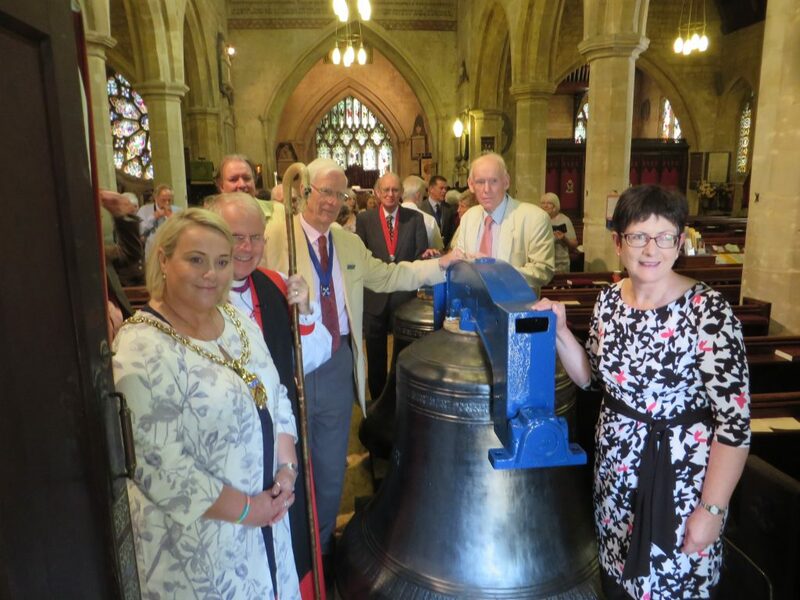 We rang the bells for the first time on 31st August 2017. They sound glorious! They go well and the front eight are easy to ring and very musical. 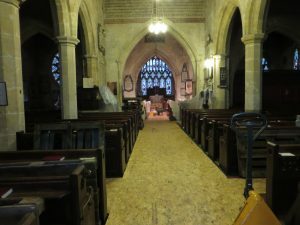 They will take a while to bed in and the sound improved when the carpet was laid. 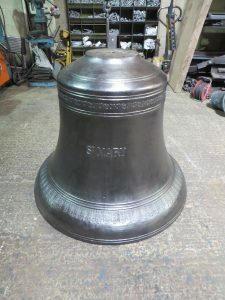 We have some learners who are making use of the training bell and the sound control makes quite a difference to the sound outside. 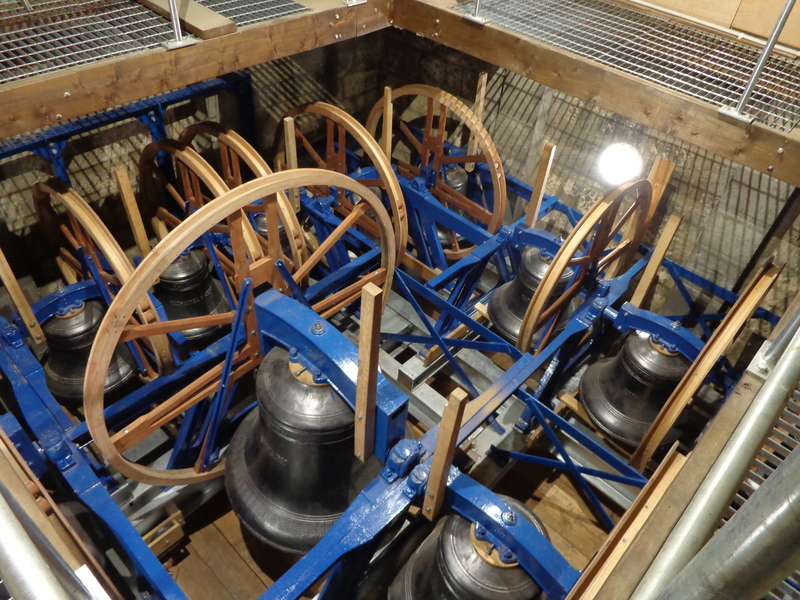 The bells are now sitting in the tower quietly waiting for the cement to harden before they are rung. 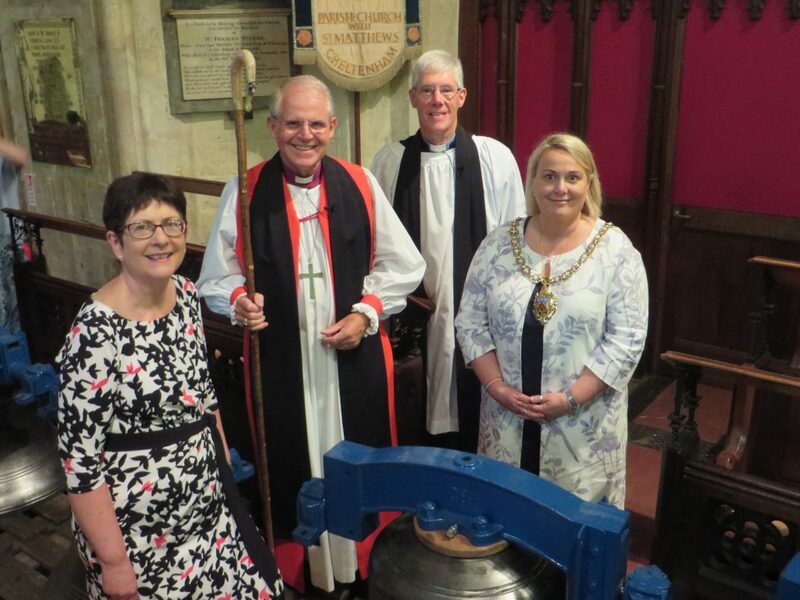 On Sunday 9th July at the 11 o’clock communion service, the retired Bishop of Crediton, the Right Reverend Bob Evens, officiated at the service to bless the bells. 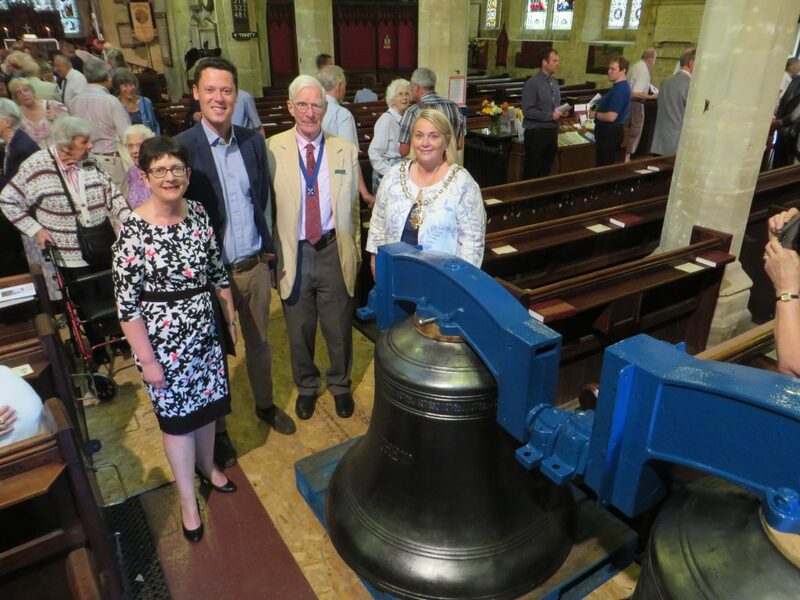 There were representatives from each of the Cheltenham towers in the congregation, as well as the Mayor of Cheltenham, Councillor Klara Sudbury and the MP Alex Chalk. 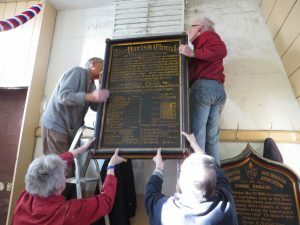 The Tower Captain, Liz Coke, read a prayer, and the Steeple Keeper, Reg Hitchings, read the Epistle. 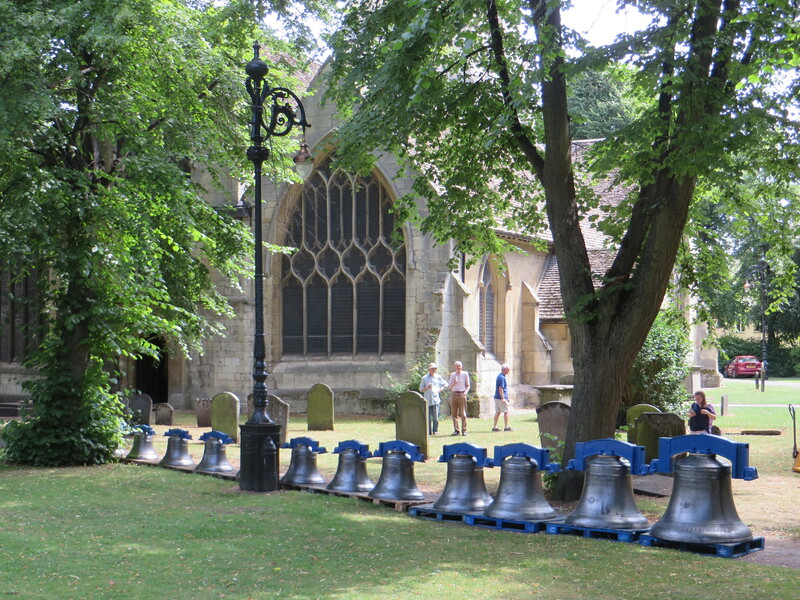 It was a beautiful day, lots of sunshine, lots of helpers and lots of onlookers when the bells arrived at the Minster. 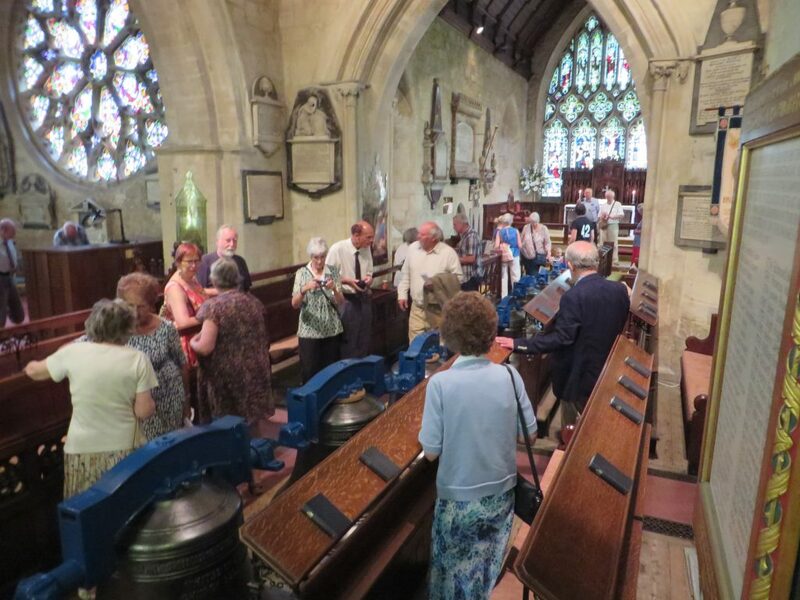 They were lined up outside the church in numerical order, then taken inside with the tenor and 11th inside the west door, and the rest down the nave. They looked fantastic. 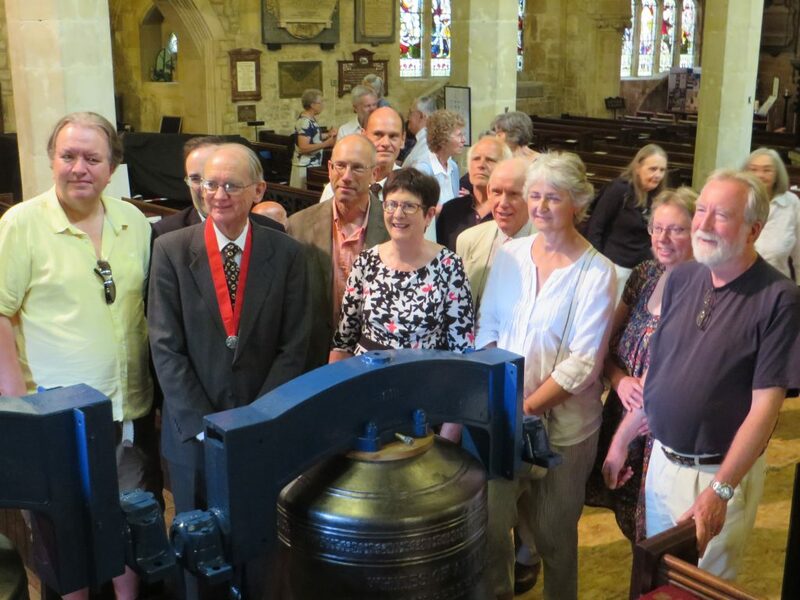 On Saturday 3rd June a band of 22 ringers visited Whites of Appleton to view the frame with 12 of the 13 new bells in place. The tenor, St Mary, was sitting separately. 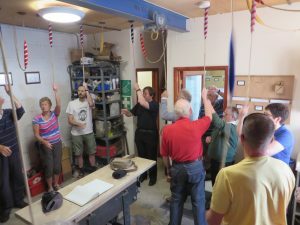 It was a really interesting visit and we finished by ringing the Whites mini ring. 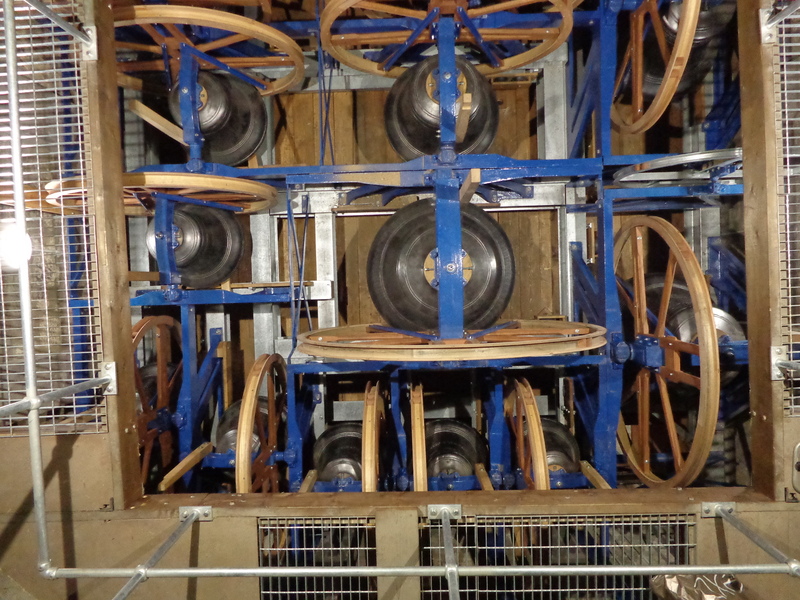 Cumbria Clock installed the new electrical winding mechanism this week and the clock is now working. 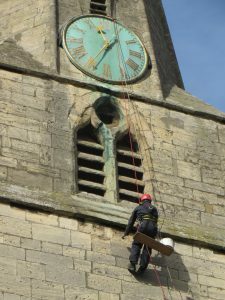 Here are photos of Terry Hill of Cumbria Clocks taking the hands off the clock face a few weeks ago. 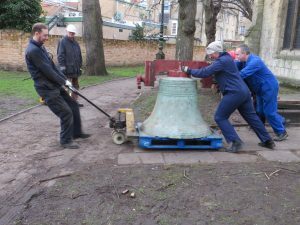 23rd March 2017 The Clock bell and Small bell both returned to the Minster. 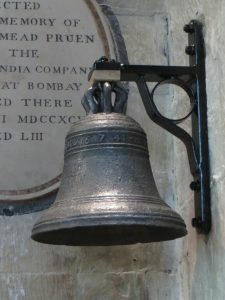 The clock bell was winched up into the bell chamber and the small bell was attached to the wall on a metal bracket to keep it safe. 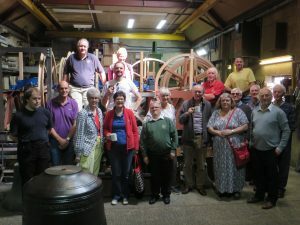 The bracket has been paid for by The Veneziana Fund, the charity provided by Pizza Express. 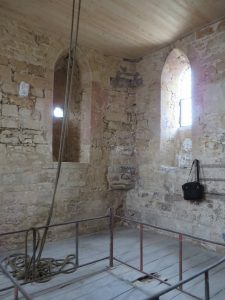 16th March 2017 visited the ringing chamber to see the walls an d marked on the floor where the ropes would fall. 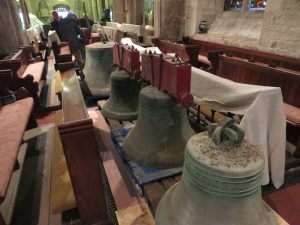 3rd March and 30th March 2017 – remainder of the bells cast. 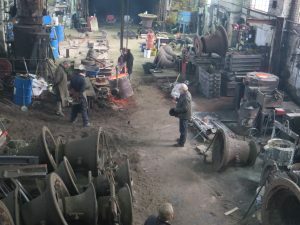 There are four dates for casting and here are pictures taken on 2nd February (with permission of the foundry). 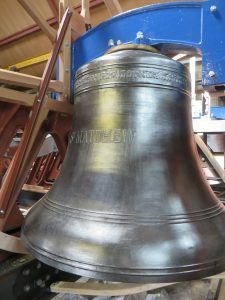 The tower captain, her husband, the rector and his secretary went on the tour of the museum and stayed to watch the casting of two of the bells (2 and #2). 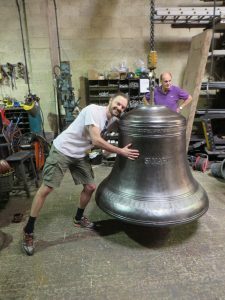 Before the bell metal was poured into the moulds, the rector was called down on to the foundry floor and asked to say a prayer. 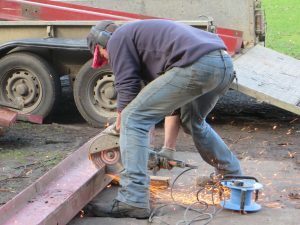 He said he was very moved to have the workers standing in silence with their heads bowed. 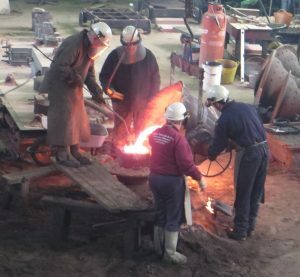 We all found it very exciting watching the molten metal poured into the moulds. We were kept well away until they had finished pouring. 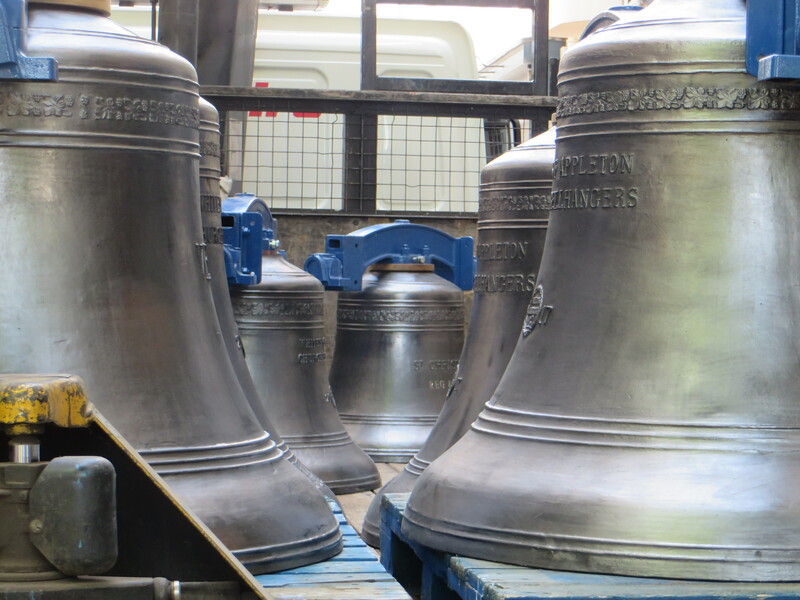 We have sold five of our old bells to two other towers, Butterton and Hawton, through the Keltek Trust. 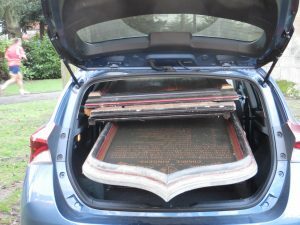 However, here is a picture of the remaining seven which will be melted down to be recycled. From week 2 – the builders are in the tower. 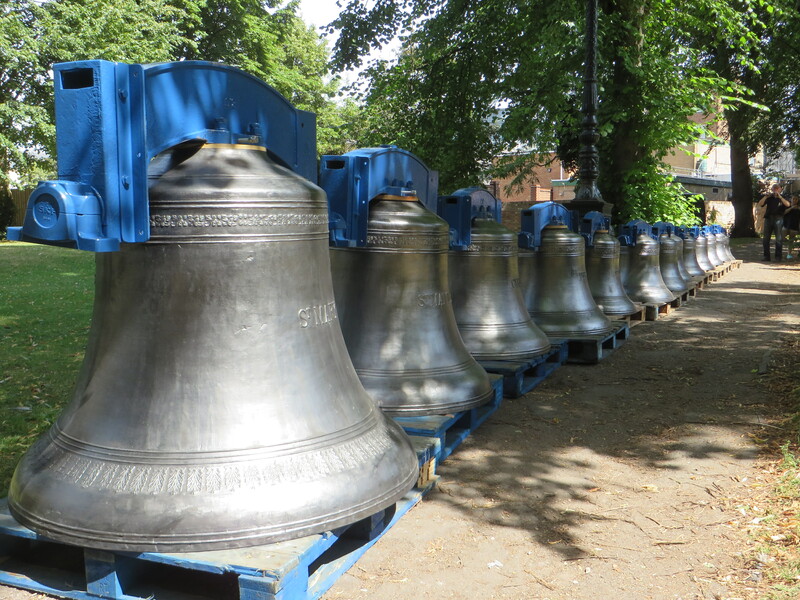 Under James Haseldine’s expert guidance all the bells were transferred out of the church and lined up in front of the porch. 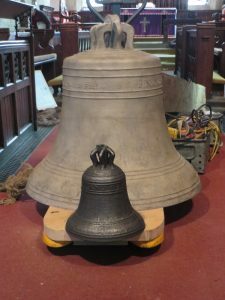 When the tenor was being manoeuvred through the door it touched the edge of the doorframe and it was noticed there was a nick in the frame from where the bell entered the church in 1823! 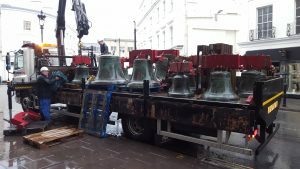 The rain started and James and Graham Clifton of White’s transferred the bells onto the back of the lorry and at about 12.30 we waved goodbye to them. 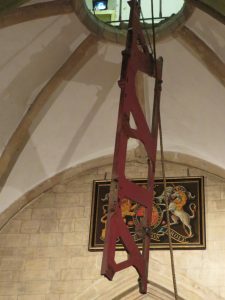 There were still large pieces of frame to be lowered into the church and stacked up ready for the trip to the scrap dealer. 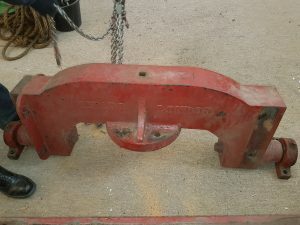 The nuts and bolts are being given to the steam railway and some of the pulley blocks and sliders are going to Little Comberton. 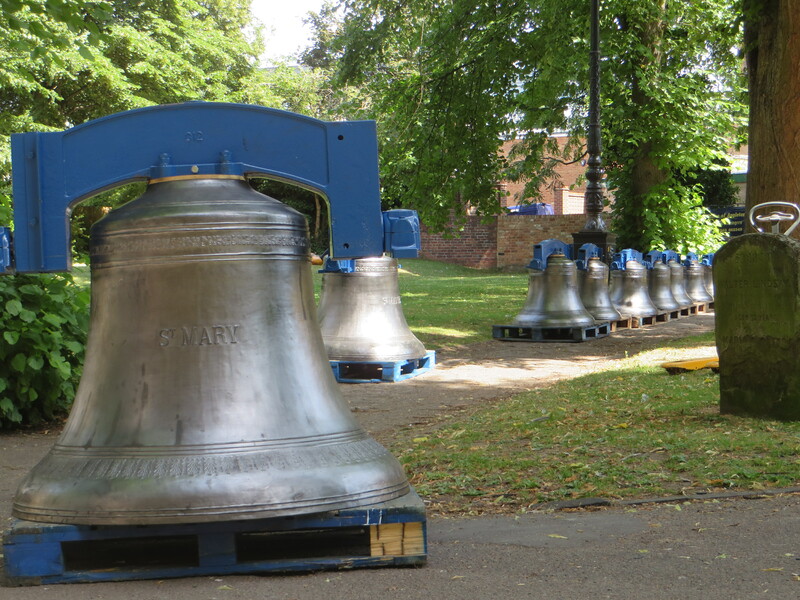 During the day the last two bells were lowered into the church along with a lot of frame. Charles had to cut some of it up to get into his trailer. 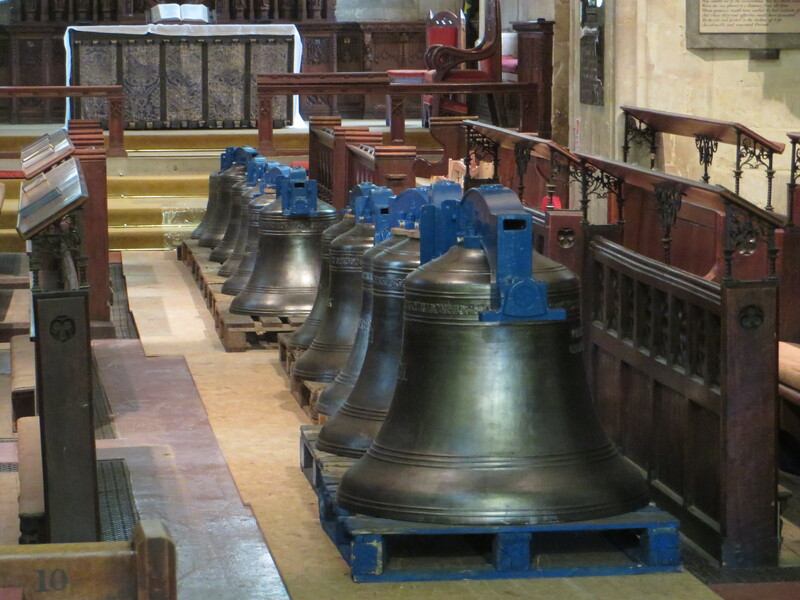 By the end of the day all the bells were in the church. 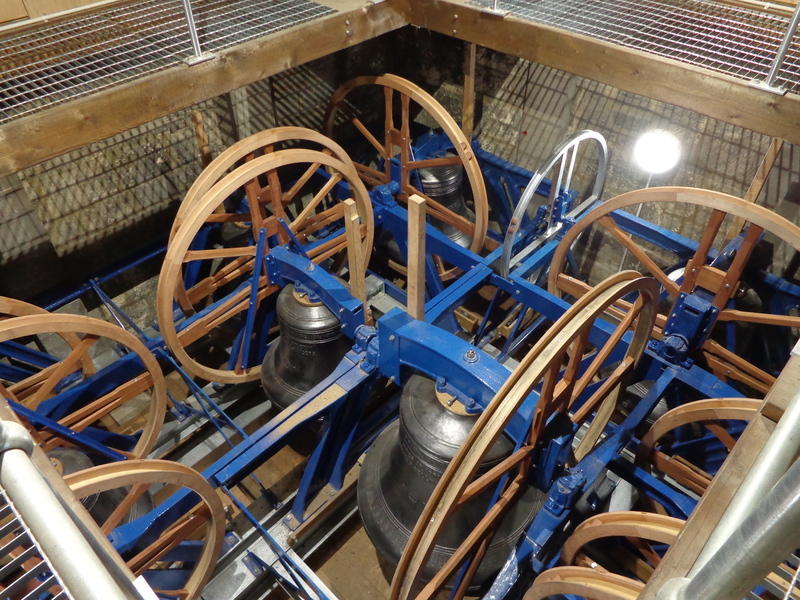 Another five bells came down along with various half wheels, clappers, stays, sliders etc. 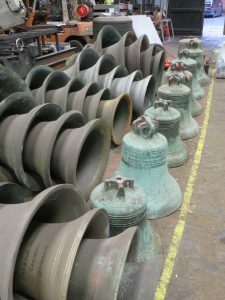 Five of the bells are being sold to other towers so their accoutrements had to be kept with them. 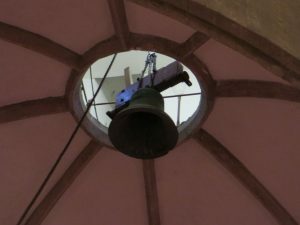 On Monday morning 9th January 2017 the trap door in the roof of the nave was opened. 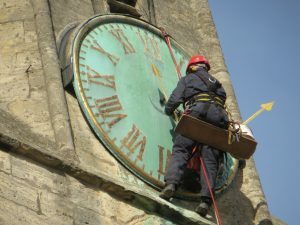 Two bell hangers and volunteers were up in the tower and during the day six bells (including the clock bell) came though and were lowered slowly to the ground. 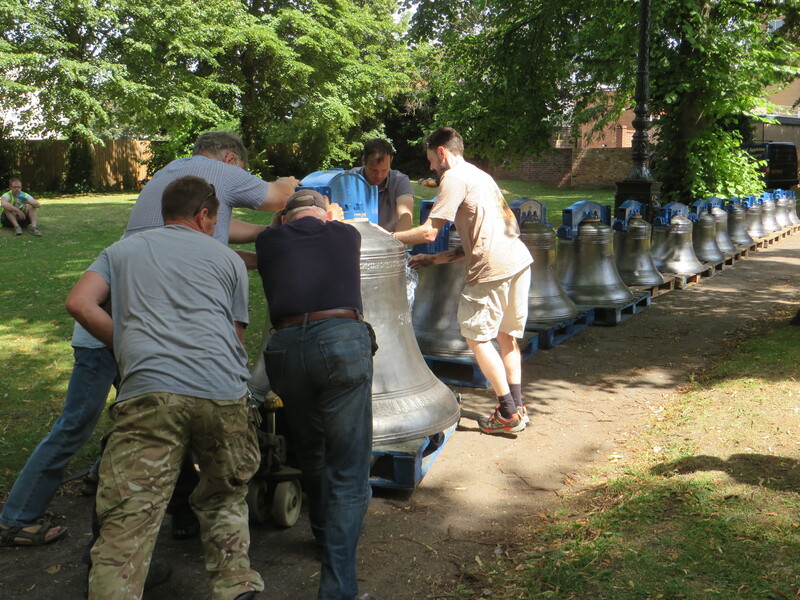 More volunteers expertly manoeuvred the bells out of the way into the choir and moved large pieces of frame out of the west door to be taken to the scrap dealer. 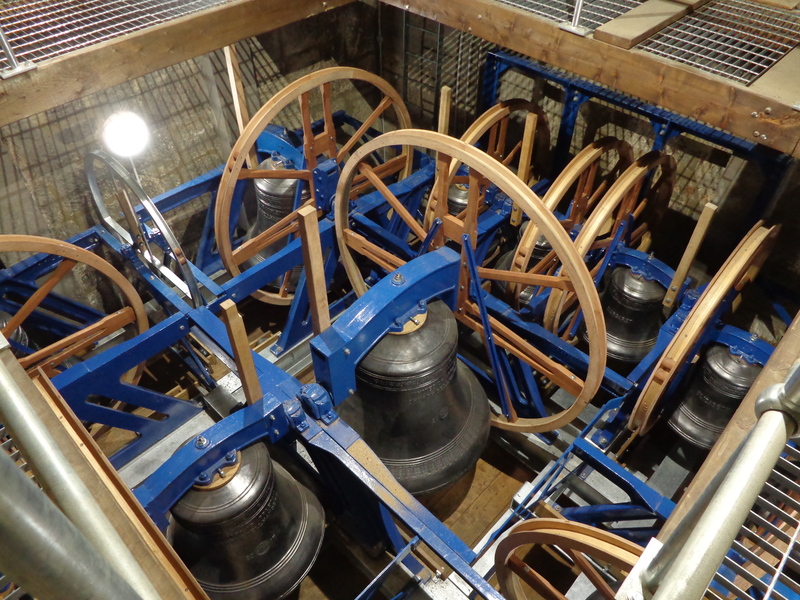 On Tuesday another five bells were lowered and the last two came down on Wednesday. .
lifted the traps to the ringing room and lowered some components to the ringing room. 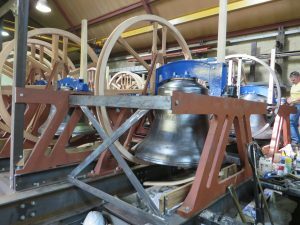 The Clock bell has been lowered to the top of the bell frame, all ready to start the main lower on Monday, Tuesday and Wednesday next week. 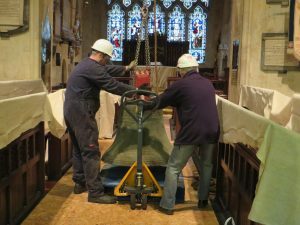 On Wednesday 28th December 2016 five of the bell ringers spent the day in the tower removing peal boards and putting them into storage.